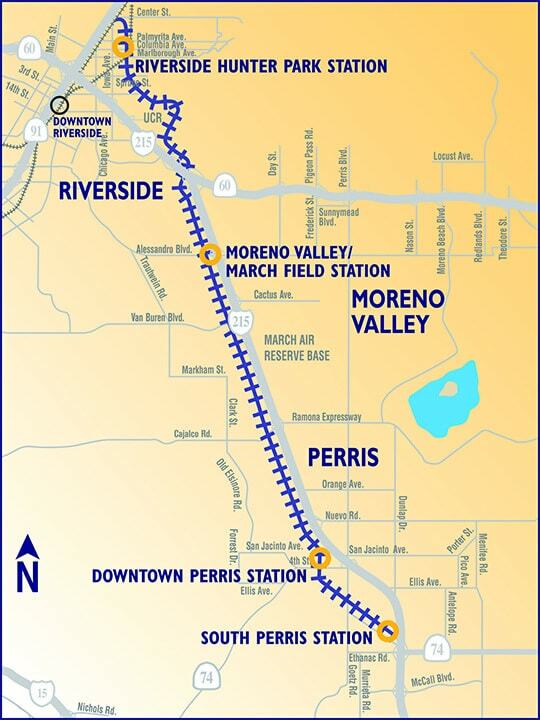 Extended the existing Metrolink 91 Line service from the Downtown Riverside station, 24 miles along the existing San Jacinto Branch Line terminating in Perris. Service began in June 2016 on the 91/Perris Valley Line, the first new Metrolink extension to open since the Antelope Valley line in 1994. 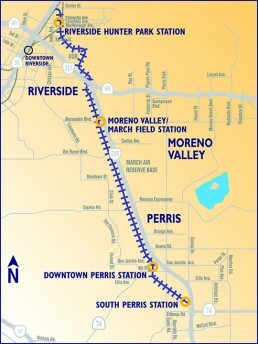 The 24-mile extension of Metrolink was designed to reduce traffic congestion on Interstate 215 and improve transit options for southwestern Riverside County residents, who have some of the longest commutes in southern California. Increased Safety – The 91/PVL upgraded 15 at-grade crossings with flashing warning devices, gates, raised center medians, striping, signs, and pavement markings. The project also added pedestrian crosswalks at two railroad crossings, upgraded and closed one crossing, and permanently closed two crossings. Quiet Zones and Noise Reduction – The 91/PVL provided infrastructure that allowed the City of Riverside to establish “Quiet Zones” at Marlborough Avenue, Spruce Street, Blaine Street, and Mt. Vernon Avenue. In Quiet Zones, railroads no longer sound their train horns when approaching grade crossings, except during emergencies or to comply with railroad regulations. Noise studies were performed to analyze the impacts of the project to area residents. Sound walls of varying heights were built near residential neighborhoods in Riverside. Improved Mobility – The 91/PVL parallels Interstate 215 and State Route 91 and provides commuters with a safe, convenient and traffic-free alternative to driving on the region’s heavily traveled freeways. freeways. Enhanced Air Quality – Metrolink, combined with regional and local bus services, provides an environmentally-friendly and energy efficient alternative to driving alone. New Jobs – By extending Metrolink to more of the region, local residents can take the train to jobs within Riverside County. During construction, the $248.3 million project created an estimated 4,400 direct and indirect jobs. Station Development – Four new stations were built to serve the 91/PVL. The new stations include Riverside Hunter Park/UCR, Moreno Valley/March Field, Perris-Downtown and Perris-South.